Despite extensive research on the molecular regulation of early tooth development, little is known about the cellular mechanisms driving morphogenesis prior to enamel knot formation. In a recent study, published with a spotlight in Journal of Cell Biology, researchers Laura Ahtiainen and Isa Uski from the research groups of Marja Mikkola and Irma Thesleff from the Institute of Biotechnology, University of Helsinki, tackle this conundrum. Their findings imply that the early signaling center is essential for tooth budding morphogenesis and is an important determinant of the tooth size. – Organ development is driven by epithelial-mesenchymal tissue interactions that are mediated by a conserved set of signaling pathways. In many developing organs, signaling molecules are produced by groups of specialized cells, signaling centers, that control cell fate specification and cellular behaviors in the surrounding tissue. Teeth, hairs, and exocrine glands are organs that develop as appendages of the embryonic surface epithelium through shared placode and bud stages prior to diversification of epithelial morphogenesis, explains researcher Laura Ahtiainen. – In teeth, a well-defined signaling center called the primary enamel knot forms at the tip of the tooth bud and is essential for further tooth morphogenesis. Despite extensive research on the molecular regulation of early tooth development, little is known about the cellular mechanisms driving morphogenesis prior to enamel knot formation. Intriguingly, gene expression pattern analyses have suggested the presence of another, earlier epithelial signaling center but its exact identity, formation, and functions have remained elusive, details researcher Isa Uski. In a recent study, published with a spotlight in Journal of Cell Biology, researchers Laura Ahtiainen and Isa Uski from the research groups of Marja Mikkola and Irma Thesleff tackle this conundrum. A systematic analysis of cell cycle dynamics using cell cycle indicator mice revealed that a non-proliferative cluster of epithelial cells emerges in tooth primordia. Co-localization with multiple signaling molecules identified these cells as the early signaling center, which the researchers named the initiation knot. 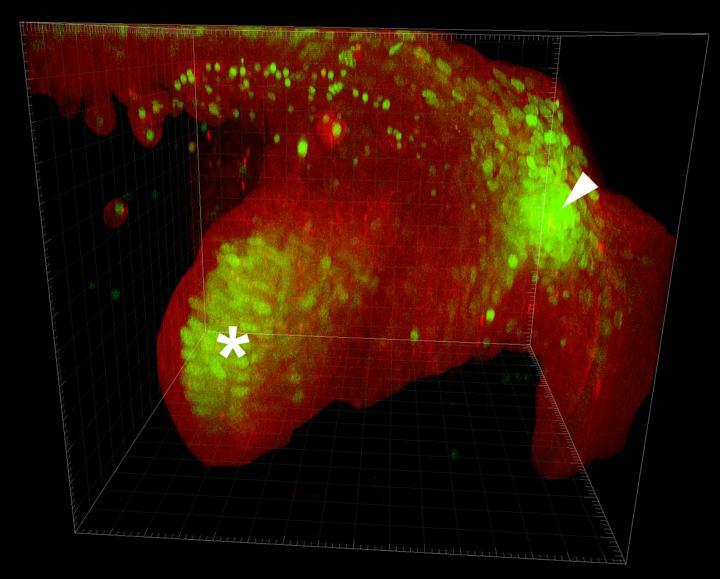 Live confocal fluorescence microscopy imaging showed that the signaling center cells reorganize dynamically, yet they do not re-enter the cell cycle or contribute to the growing tooth bud. Instead, the initiation knot drives epithelial invagination by instructing the neighboring cells to proliferate. – These findings imply that the early signaling center is essential for tooth budding morphogenesis and is an important determinant of the tooth size. The study also identified the ectodysplasin pathway as a critical regulator of the initiation knot size and function. This sheds light on the mechanisms how ectodysplasin deficiency causes tooth agenesis in humans, summarizes Irma Thesleff. Laura Ahtiainen, the first author of the article, continues to explore the cellular mechanisms of tooth morphogenesis in her recently established lab at the Institute of Biotechnology, University of Helsinki.